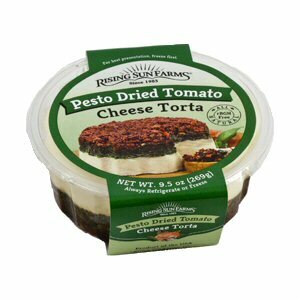 The Pesto Dried Tomato Cheese Torta was the first of a long range of Cheese Tortas made by Rising Sun Farms, only 9.5 ounces of award winning delight you should actually try, at least once. Each Torta is made with exquisite farm fresh cream cheese, tastefully blended and layered with fresh organic herbs, spices and other delicacies. The Pesto Dried Tomato contains Parmesan and Romano cheeses, contains sweet dried tomatoes, organic basil and zesty garlic and other great ingredients. Ingredients: rBGH free cream cheese (pasteurized cultured milk and cream, salt, stabilizers (xanthan, and/or carob bean and/or guar gums)), basil, dried tomatoes (sulfite free), Parmesan and Romano cheese (pasteurized part-skim cow's milk, sheep's milk, cheese cultures, salt, enzymes, rennet (microbial), unsalted butter (cream), olive oil, fresh garlic, white balsamic vinegar (white grate must, white wine vinegar, caramel color), almonds (tree nut), rice vinegar, extra virgin olive oil, soy lecithin, sea salt, filtered water.